This graphic novel series flies off my shelves, and I constantly have to answer the question, “Why haven’t you ordered number 6!” Those of you following the Amulet series will know that there isn’t a number 6 yet. I can see why this book is so popular with my students. There is a great mix of something tragic, something mysterious and a new fantasy world. The illustrations are really beautifully done. Highly recommended for third grade and older. Emily and Navin lose their father in a car accident and move to a remote town with their mom. The house they move to is an old house owned by their great grandfather Silas. 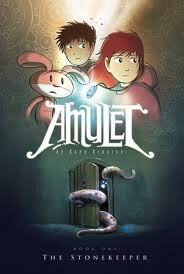 When Emily and Navin wander upstairs, they discover a room and a mysterious amulet. When their mother is lured into a trap, the children follow her, guided by a mechanical rabbit named Miskit. They find their great grandfather on his death bed. He urges Emily to become the new Stonekeeper, leading her into a new world and teaching her the power of the Amulet. Written in 1969, this is a timeless book about friendship. Leo Lionni’s beautiful and colorful illustrations make the book come alive. 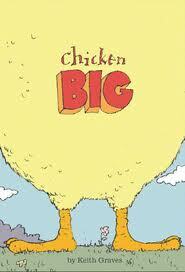 My kindergartners loved this book. I hope you will as well. Alexander is a mouse who is constantly being chased when he looks for food. One day, he finds another mouse, Willy. Willy is a wind-up mouse who is loved by the family, because he is a toy. Alexander and Willy become good friends, but Alexander is jealous that Willy is so loved while he, Alexander, is so hated. Willy tells him that he can go talk to a chameleon in the yard who can turn him into a wind-up mouse. When Alexander finds Willy in a box of old toys to be thrown away, Alexander’s mission to join his friend becomes even more urgent. Read this great book to find out how it all works out. How many of you can say, “Tikki Tikki tembo-no sa rembo-chari bari ruchi-pip peri pembo” without even thinking? 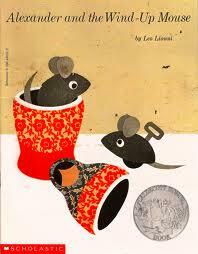 I had great memories of this book from my own childhood, then reading it to my son and now reading it to my students. I’m thrilled to see that my students can chant the name just as enthusiastically as I used to do. I love the story and the incredible illustrations by Blair Lent. 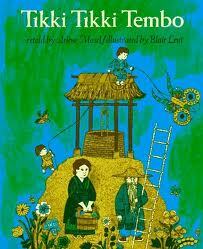 First published in 1968, Tikki Tikki tembo is the retelling of an ancient Chinese folktale. It’s the story of two brothers. The first, honored son has a great, long name, which means “the most wonderful thing in the whole wide world!” The second son has a short name, Chang, which means “little or nothing.” Tikki Tikki tembo-no sa rembo-chari bari ruchi-pip peri pembo pays the price for his great, long name when he falls into a well and needs to be saved. His little brother struggles to tell others that his brother has fallen into the well. It’s a classic and well worth a read. Enjoy.